Credit scoring determines if you get a loan for a house, a car, or any other major purchase. Based on your past behavior with credit purchases and paying those debts, your credit score could also determine if lenders or creditors will trust you and, if not, charge you deposits or higher interest rates. Your credit, spending and payback history can't be erased so trying to improve your credit score may seem impossible. Ready for some good news? Improving your credit score is possible with consistent effort and new changes from credit reporting bureaus. According to the credit reporting bureau Experian, a good credit score is typically anything over 700 on a scale from 300 - 850. 800 and above is considered excellent but most credit scores range from 600 - 750. Obviously higher credit scores means the more likely a creditor or lender will trust that you will pay back the loan. Elements that make up your credit score include your ability to make payments on time, how much of the credit you are using, your total debt, the type and number of credit accounts you have, the age of those accounts, and any inquiries for your credit including how many new accounts were opened recently. 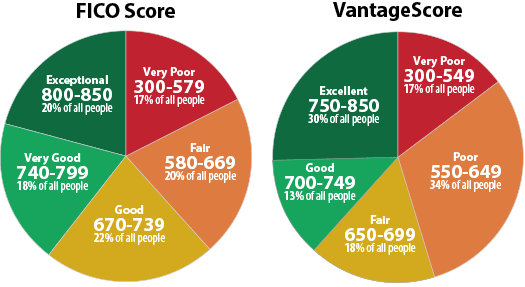 Most mortgage and other lenders use FICO scoring but some may use the VantageScore model instead. The image below (care of the Experian website) explains the main differences between the two. As clearly illustrated, your ability to obtain credit or a good interest rate is going to depend on which model the creditor is using. Know your credit score - It seems obvious enough but if you don't know your current score, how will you know if you've improved? Some credit card companies may offer a way to obtain your credit score monthly and for free. You can also check with sites like myfico.com (paid) or VantageScore offers a list of free credit score providers. Review your credit report - Again, if you don't know what's being reported against you, you will be unable to fix it. You are allowed one free credit report per year that can be obtained from annualcreditreport.com. You also have a right to dispute any false or inaccurate information on your credit report. Pay down debt - If you have outstanding debt balances and/or your percentage of used credit is high, paying down debt is one way to improve your credit score. Low card balances greatly improve your credit score. Pay all of your bills on time - Because payment history, delinquent payments and collections affect your credit score, paying your bills on time, even if it's the minimum payment, can ensure your credit score doesn't take a hit. Paying late on utility bills, mortgage, retail cards and even forgetting to turn in your cable box can negatively affect your credit. Only apply for credit when necessary - Minimizing the amount of credit inquiries is a good idea for bringing up that credit score. How are credit report bureaus helping with credit scores? The three credit bureaus, Experian, TransUnion and Equifax, have recently announced a new way of scoring consumer credit. Beginning this fall 2017, VantageScore will put more weight on overall debt trends of an individual consumer. Putting more of an emphasis on credit and debt trends means that someone who is paying off debt will notice an improved credit score versus someone who is taking on more debt or using more of their credit. Two individuals may currently have the same score but may have dramatically different spending habits. For instance, if someone who typically maintains low credit card balances suddenly spends more credit - for a home or other large purchase - their score may drop down to a level of someone who has higher credit card balances. With the new model, their score would be affected much less. In the past two years, the credit bureaus announced that they would wait 6 months before reporting medical debt. With the shock of unexpected medical emergencies, often credit reports were affected before insurance could pay off the debt or the patient could work out a payment plan. Credit bureaus are also working to handle credit disputes and inaccuracies quicker and more efficiently since so many Americans are affected by mistakes on their credit report. The good news is that there is a chance that credit reporting bureaus and your own diligence can bring up your credit scores. The more informed you are - about your credit, about your options, and about how your choices affect your credit score - the more empowered you will feel. At BYL Collections, we believe in educating empowered consumers and working with them to bring payments current and improve credit scores. Subscribe to this blog to learn more about your rights and how best to work will collections agents.